Theory of civil polity which advocates public collective ownership, production, and distribution. Jews have been prominently identified with the modern Socialist movement from its very inception. The small circle of the first disciples of Saint-Simon in the third decade of the nineteenth century numbered among its members two Jewish young men of Portuguese origin, the brothers Isaac and Emile Péreire. A generation later, when the apostles of Saint-Simonism had distinguished themselves in various fields of science and industry, the Péreire brothers won fame and fortune as the builders of the first French railway, and became the leading bankers and financiers of the second empire. Paris in the thirties and forties was the intellectual capital of Europe. "Young Germany" was, after the Napoleonic wars, under the sway of French democratic ideas. The Socialist theory was regarded as an application of the principles of democracy to the industrial organization of society; and it was but natural that it should soon enlist the sympathies of the numerous Germanrefugees who in those days made Paris their head-quarters. Karl Ludwig Börne notes in his "Briefe aus Paris," though in a somewhat light vein, the appearance of the Saint-Simonists in the advanced intellectual circles of Paris. The educated German Jews, who were still suffering under legal disabilities and social discrimination, were active in the Democratic movement of their day. The spread of the socialistic faith among the German colony at Paris was therefore bound to convert Jew and Gentile alike. Two of those early Jewish converts, Karl Marx and Ferdinand Lassalle, were to become commanding figures in the history of socialism: one as the father of scientific socialism, the other as the founder of the German Socialist party. Marx, the son of a Jewish lawyer of Treves, numbered among his ancestors many famous rabbis. The chapters on the theory of value in his principal work, "Das Kapital," suggest by their subtle analysis an inherited Talmudical bent, though his own education was uninfluenced by Jewish studies, the family having been converted to the Lutheran Church during his early childhood. In 1842 he became editor of the "Rheinische Zeitung" at Cologne; but after a short existence the journal was suppressed by the Prussian government. 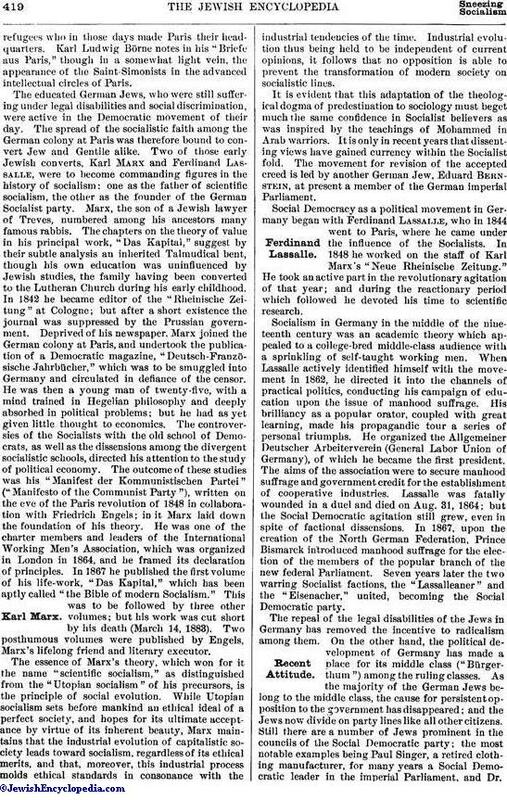 Deprived of his newspaper, Marx joined the German colony at Paris, and undertook the publication of a Democratic magazine, "Deutsch-Französische Jahrbuücher," which was to be smuggled into Germany and circulated in defiance of the censor. He was then a young man of twenty-five, with a mind trained in Hegelian philosophy and deeply absorbed in political problems; but he had as yet given little thought to economics. The controversies of the Socialists with the old school of Democrats, as well as the dissensions among the divergent socialistic schools, directed his attention to the study of political economy. The outcome of these studies was his "Manifest der Kommunistischen Partei" ("Manifesto of the Communist Party"), written on the eve of the Paris revolution of 1848 in collaboration with Friedrich Engels; in it Marx laid down the foundation of his theory. He was one of the charter members and leaders of the International Working Men's Association, which was organized in London in 1864, and he framed its declaration of principles. In 1867 he published the first volume of his life-work, "Das Kapital," which has been aptly called "the Bible of modern Socialism." This was to be followed by three other volumes; but his work was cut short by his death (March 14, 1883). Two posthumous volumes were published by Engels, Marx's lifelong friend and literary executor. The essence of Marx's theory, which won for it the name "scientific socialism," as distinguished from the "Utopian socialism" of his precursors, is the principle of social evolution. While Utopian socialism sets before mankind an ethical ideal of a perfect society, and hopes for its ultimate acceptance by virtue of its inherent beauty, Marx maintains that the industrial evolution of capitalistic society leads toward socialism, regardless of its ethical merits, and that, moreover, this industrial process molds ethical standards in consonance with the industrial tendencies of the time. Industrial evolution thus being held to be independent of current opinions, it follows that no opposition is able to prevent the transformation of modern society on socialistic lines. It is evident that this adaptation of the theological dogma of predestination to sociology must beget much the same confidence in Socialist believers as was inspired by the teachings of Mohammed in Arab warriors. It is only in recent years that dissenting views have gained currency within the Socialist fold. The movement for revision of the accepted creed is led by another German Jew, Eduard Bernstein, at present a member of the German imperial Parliament. Social Democracy as a political movement in Germany began with Ferdinand Lassalle, who in 1844 went to Paris, where he came under the influence of the Socialists. In 1848 he worked on the staff of Karl Marx's "Neue Rheinische Zeitung." He took an active part in the revolutionary agitation of that year; and during the reactionary period which followed he devoted his time to scientific research. Socialism in Germany in the middle of the nineteenth century was an academic theory which appealed to a college-bred middle-class audience with a sprinkling of self-taught working men. When Lassalle actively identified himself with the movement in 1862, he directed it into the channels of practical politics, conducting his campaign of education upon the issue of manhood suffrage. His brilliancy as a popular orator, coupled with great learning, made his propagandic tour a series of personal triumphs. He organized the Allgemeiner Deutscher Arbeiterverein (General Labor Union of Germany), of which he became the first president. The aims of the association were to secure manhood suffrage and government credit for the establishment of cooperative industries. Lassalle was fatally wounded in a duel and died on Aug. 31, 1864; but the Social Democratic agitation still grew, even in spite of factional dissensions. In 1867, upon the creation of the North German Federation, Prince Bismarck introduced manhood suffrage for the election of the members of the popular branch of the new federal Parliament. Seven years later the two warring Socialist factions, the "Lassalleaner" and the "Eisenacher," united, becoming the Social Democratic party. The repeal of the legal disabilities of the Jews in Germany has removed the incentive to radicalism among them. On the other hand, the political development of Germany has made a place for its middle class ("Bürgerthum") among the ruling classes. As the majority of the German Jews belong to the middle class, the cause for persistent opposition to the government has disappeared; and the Jews now divide on party lines like all other citizens. Still there are a number of Jews prominent in the councils of the Social Democratic party; the most notable examples being Paul Singer, a retired clothing manufacturer, for many years a Social Democratic leader in the imperial Parliament, and Dr.Victor Adler, the acknowledged leader of the Austrian Social Democracy. While in Germany socialism has attracted individual Jews, in Russia it has become a movement of the Jewish masses. During the reign of Alexander II. the high schools and universities were thrown open to Jews. All classes, rich and poor alike, eagerly embraced the educational opportunities thus offered; and in the eighth decade of the nineteenth century Jews contributed a large contingent of the students. As in Germany, education quickened their resentment of legal discrimination against their race. This was the time when the universities became the hotbeds of socialistic agitation: the Socialists preached and practised the doctrine of equal rights, without distinction of race or creed; and the Jewish student, welcomed as a social equal, began to feel like one of the Russian people. As a natural consequence, numbers of Jewish students threw themselves into the Russian socialistic and revolutionary movement. The anti-Jewish riots of the next decade produced a strong reaction against this socialistic sentiment; furthermore the wave of emigration to the United States carried away many Jewish Socialists, while others joined the ranks of the Palestinians (the forerunners of the Zionists). Anti-Semitism made rapid progress among university students; and even the populist faction of the Socialists ("Narodniki") fell under its influence. The revival of socialistic agitation in the nineties found a fruitful field among the Jewish working men and women in the Pale of Settlement. In 1897 was organized the Jüdischer Arbeiter-Bund von Littauen und Polen (Jewish Labor Federation of Lithuania and Poland), which grew rapidly in spite of persecution, and soon became the strongest and best-organized body of Socialist working men in Russia. The organization and growth of the Bund have been among the principal causes of the recent revulsion of Russian public sentiment in favor of the Jews. Formerly the individual Jewish Socialists counted as Jews only in so far as they offered another justification for the anti-Semitic policy of the government; while with the revolutionary Socialists they passed as Russians, and as such reflected no credit upon the Jewish race. The Bund made its appearance as a distinctively Jewish organization, and demanded recognition for the Jewish working class. The newspaper-reading Russian public outside the Pale had been convinced by the anti-Semitic press that the Jews were a race of parasites, and that there was no laboring class among them; the existence of the Bund was in itself the most conclusive refutation of this charge. The Bund marks a new departure in the progressive movement among the Jews. Heretofore assimilation with the dominant race has been the first article of faith with all Liberal and Democratic Jews. The Bund, on the contrary, asserts the claims of the Jewish people as a distinct nationality. It takes for its model Austria with her polyglot population, where the principal Slavonic tribes, the Poles, the Ruthenians, and the Bohemians, are contending, not without success, for linguistic autonomy, as distinguished from territorial autonomy. The advocacy of this principle by the Bund has brought it into conflict with the cosmopolitan tendency of the Socialist movement. It is contended by the opponents of the Bund that its policy creates division within the Socialist ranks. It must be noted, however, that the Bund addresses itself to those classes of the Jewish people which under the existing social conditions rarely, if ever, come into contact with other races. At the same time all other Russian and Polish Socialist organizations still contain a large and influential Jewish membership. The Jewish exodus from Russia drafted to the United States large numbers of Socialists, mostly college and university students, who must be reckoned among the pioneers of the Socialist parties in America. Their main field of activity was the ghetto. But the masses of Jewish workmen and tradesmen who were educated by this propaganda scattered throughout the country in pursuit of employment or business opportunities and became "the pedlers of socialism" among their shopmates and neighbors. The city of Haverhill, Mass., which elected the first Socialist mayor in the United States, is a notable example of the proselytizing work of Russo-Jewish Socialists. The Russian Jews themselves have contributed their quota to the rank and file, as well as to the leaders, of the American Socialist parties. One of the prominent national leaders is Morris Hillquit, a young Russo-Jewish attorney in New York, author of "The History of Socialism in the United States" (New York, 1903). The Jewish Socialist movement in America has created a Socialist literature in the Yiddish language. 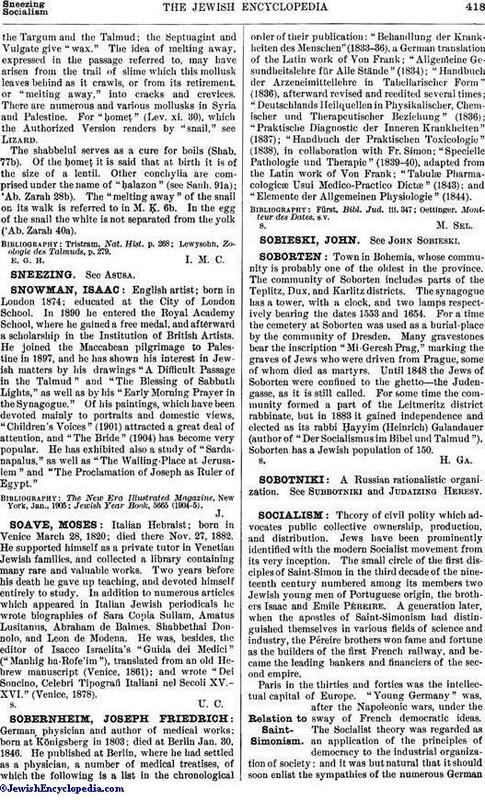 The first attempt to present socialism to the Jews in their own language was made in 1874, when two young Russian Jews, Aaron Liebermann (d. 1880) and M. Winchevsky, published in Vienna a small magazine entitled "Ha-Emet." It addressed itself to the intellectual class of the Russian Jews—the Maskilim—and was printed in Hebrew, their literary language. This publication, however, was short-lived. 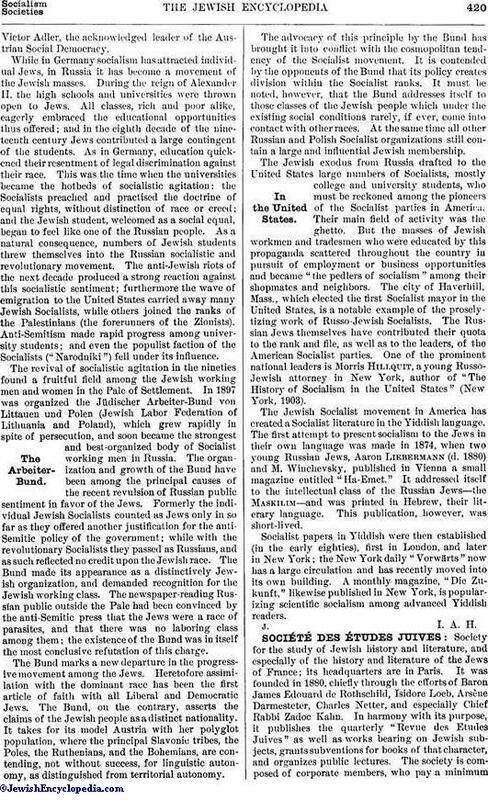 Socialist papers in Yiddish were then established (in the early eighties), first in London, and later in New York; the New York daily "Vorwärts" now has a large circulation and has recently moved into its own building. A monthly magazine, "Die Zukunft," likewise published in New York, is popularizing scientific socialism among advanced Yiddish readers.